1900's vintage Edwardian era earrings. Black jet, 14K gold and black enamel. 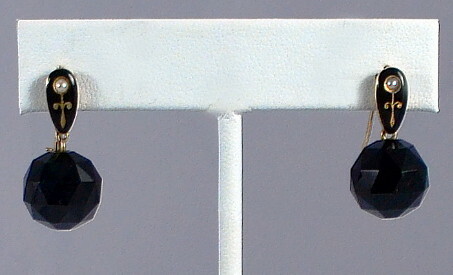 Faceted black jet ball drop. Gold with black enamel and tiny pearl. Gold wires, test 14K. All original Edwardian era, true 1900's vintage. Excellent condition. One wire is slightly bent.